Fill a large pot with lightly salted water and bring to a rolling boil over high heat. Once the water is boiling, stir in fettuccine; return to a boil. Cook the pasta uncovered, stirring occasionally, until the pasta has cooked through, but is still firm to the bite (about 11 minutes). Drain well in a colander set in the sink. While pasta cooks, prepare chorizo in a nonstick pan over medium-high heat until fully cooked; about 4-6 minutes breaking it up into smaller pieces with spoon. Remove chorizo from pan and place on a paper towel-lined plate to drain. Remove all but 1 teaspoon of chorizo fat and return to heat. Add onions and cook until softened (about 4 minutes) and add garlic and salt and pepper. Continue to cook an additional minute. Return chorizo to pan reduce heat and add chicken broth and cream; stir to combine. Add cooked pasta and combine well. Serve warm garnished with cilantro. Mexican Crema can be found in the specialty cheese section of your grocery store. Looking for an easy weeknight meal? Why not try pasta with chorizo! This pasta dish is sure to please everyone at your table. 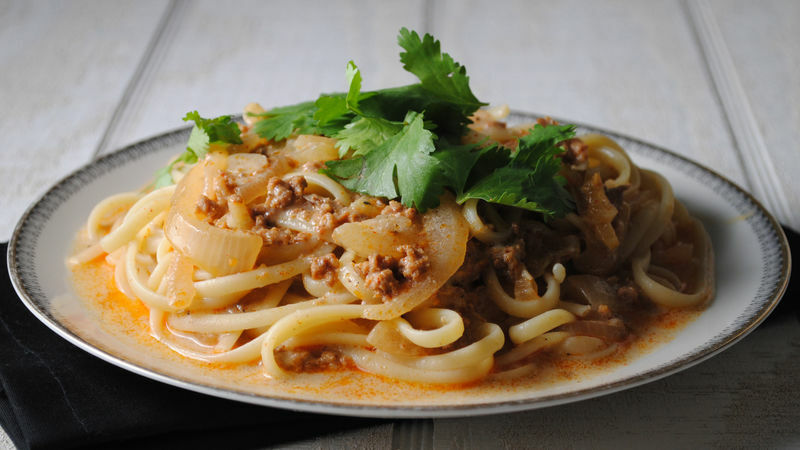 Freshly cooked pasta is tossed with a light chorizo cream sauce. Onions are cooked until softened and tossed with Mexican chorizo, chicken broth and crema. Mexican crema is slightly thicker than heavy cream, but if it not available in your local grocery store feel free to use heavy cream.